On the morning of April 12, 2018, the third Yenching Global Symposium (YGS) officially commenced at Peking University. YGS is a four-day conference lead and organized by scholars from the Yenching Academy of Peking University. Yesterday, Yenching Academy scholars, alumni, experts, and more than 200 outstanding delegates from 62 different countries gathered around the theme of: “Renaissance: China's Journey in a Global Future”. The theme of this year’s forum is an in-depth exploration of China's multi-faceted renaissance in a rapidly shifting global arena. This forum also serves as Yenching Academy’s commemoration of Peking University’s 120th anniversary. The Opening Ceremony kicked off with Liu Hengqi's mesmerizing performance on the Gu Qin. Through his lyrical melody, he adeptly conveyed the wisdom and philosophy of the Chinese ancients. Giving the opening speech, Aliza Warwick, a third cohort American scholar at Yenching Academy, shared her story as the Chairwoman of the Symposium’s Executive Committee. She described a conversation she had with a Beijing taxi driver about China’s rising role in the world and how it resonated with the forum’s theme. Ms. Warwick reflected on her experiences at Yenching Academy, sharing her hopes about what the Symposium would bring to the delegates and Yenching Scholars participating. During the months leading up to the event, she and her fellow students on the Executive Committee spent months working tirelessly to set the agenda and prepare for the Symposium. After Ms. Warwick shared her vision for the conference, Dean Yuan Ming warmly welcomed all guests and encouraged participants to exchange and debate during the forum. She briefly reviewed the themes of previous forums, reflecting on the creative and innovative thinking of Yenching students. Finally, Dean Yuan Ming asked: “who are we?”, prompting the audience to continue exploring different identifies, groups, societies, and countries. With her opening remarks, Dean Yuan Ming encouraged participants to collaboratively contribute to the future development of the world. Wrapping up the Opening Ceremony was Li Jing, the Global Head of Enrollment and Marketing at Whittle School and Studios. She delivered her insights on the globalization of education. She began her keynote speech by congratulating Yenching scholars for actively exploring ‘international education’. By sharing her stories of working with a Native American student at a school in China, she proposed that “internationalization is not one-way, but bi-directional,” and emphasized the responsibility of teachers to promote international education. Following the Opening Ceremony, Li Shan, CEO of Silk Road Finance Co. Ltd., delivered a keynote presentation on the "Belt and Road Initiative". After reviewing the history of the ancient Silk Road, he analyzed the opportunities and challenges that the “One Belt and One Road Initiative” will face. He talked about strategic development through the six trade corridors and the “five-pass” plan, whereby countries along the route share common opportunities of direct investment and infrastructure construction. However, he mentioned the challenges they face including: operational barriers, fundraising, and project operations. Mr. Li referenced the "Digital Silk Road”, and other innovations such as electronic money, online trade, and the development of smart cities as strategies towards creating a brighter future. This four-day Symposium will focus on “Renaissance" and topics such as culture, entrepreneurship, women, economics, education, environment, health, and science and technology. Additionally, there will be a number of hands-on activities such as cultural workshops and site visits to local organizations in Beijing. This year’s Symposium will also host an inaugural Concert where the “Oriental Beauty Youth Orchestra of Wuhan” will perform classical Chinese music. This year, YGS received almost double the number of applications than the year before, with candidates from over 160 countries and regions. The YGS committee has selected 80 outstanding delegates from over 4,000 applicants for its 2018 conference on Peking University’s renowned campus. With an acceptance rate of only two percent, this year’s applicant pool was the most competitive yet. YCAST 燕语 - Yenching Academy's student podcast - brings you event recordings and conversations with the Symposium speakers & delegates below. 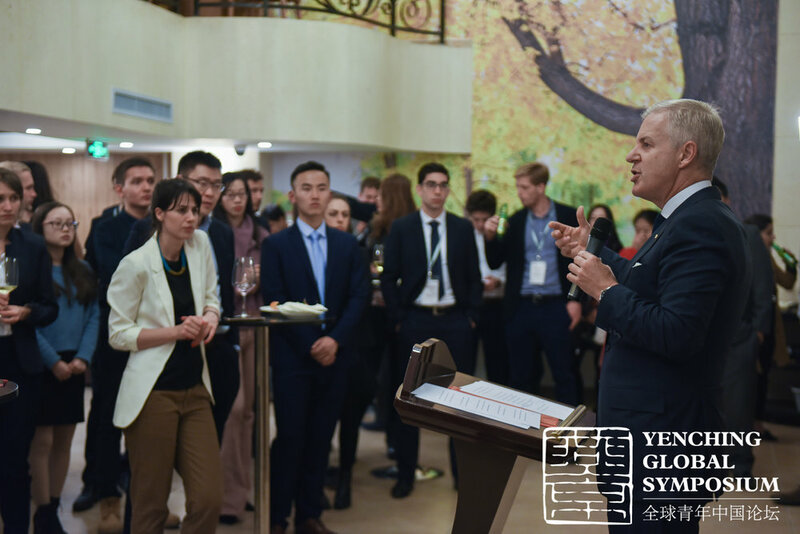 Stay tuned in the near future for full-length episodes about each day of Yenching Global Symposium! Peggy Liu is Chairperson of JUCCCE, a non-profit organization for accelerating the greening of China and a leader in China’s clean energy landscape. 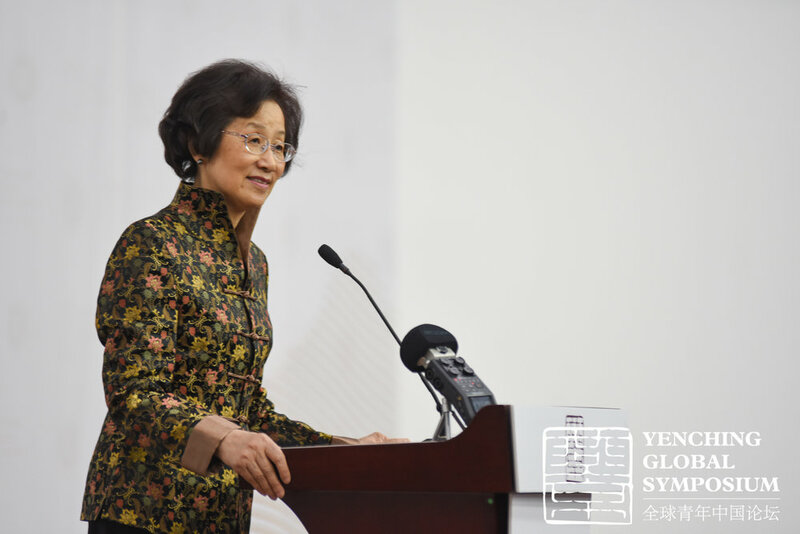 She passionately addressed the Yenching Global Symposium delegates about measures taken by China over the years to address environmental pollution and climate change and introduced various ways individuals and organisations can take part in sustainable and green development. David Moser: Before the Education panel, YCAST sits down with the eminent David Moser sits down with YCAST to talk about innovation in the Chinese Educational sector, his conference colleagues, and his book "A Billion Voices" on the modern Chinese language. Irene Shao: Irene Shao is the East and Southeast Asia Lead for Khan Academy. Irene shared her vision for more innovative and individualized education and explained how her work can help to enhance education for young people. We also discussed about the Chinese education system and what motivated her to realize her passion in education while studying in China. Veronica Li: Veronica Li is the Director of International Programs at Raising Culture. She develops and implements educational programs on design thinking and social entrepreneurship through project based learning. We talked about her views on education for the 21st century and her experience participating in the Yenching Global Symposium’s education panel. David Weeks: David Weeks is the co-founder and COO of Sunrise International Education and is a former American debate champion and a debate instructor. He shared his experience of teaching debating to Chinese students and thoughts after moderating the education panel. Introduction (Megan Steffen): The Health panel brought together environmental specialist Kate Logan, public health expert Professor Tang Kun, and anthropologist Lili Lai for an enlightening discussion on different aspects of health and health innovation. Take a listen first to a discussion with moderator Megan Steffen for an introduction to major themes that emerged. Stay tuned for the health panel audio, a chat with Kate Logan, and extended interview with Dr. Lili Lai! To explore today’s topic of “direction,” the Yenching Global Symposium hosted a panel on international relations. It was moderated by Matt Ferchen, a Resident Scholar at the Carnegie-Tsinghua Center and an Associate Professor of International Relations at Tsinghua University. Dr. Ferchen’s work has research has focused mostly on the Chinese model of economic and political development, as well as Chinese relations with Latin America. The panel provided an interesting array of diverse perspectives. The first panellist was Hannah Ryder, a British and Kenyan diplomat, as well as the former Head of Policy and Partnerships and the UN Development Program in Beijing. She shared her initial motivation in coming to China, having seen the large impact that China was making on her native Kenya. She wanted to learn about the Chinese system in order to make the relationship work not only for the Chinese, but also for the recipients of Chinese aid and outbound direct investment (ODI) in Africa. Representing the Australian perspective was John Denton, a former diplomat and the current Partner/CEO of Corrs Chambers Westgarth, a prominent Australian law firm. He shared the challenge which China’s relationship with Australia presents to the Australian government. He noted that China is increasingly important to Australia economically, but does not have an alliance or even shared values with the Australian government. Thus, there is often a clash of interests that the Australian government must mitigate. He shared how Australia’s legal framework was not prepared to handle the influx of Chinese investment into the country, which jumped from $3 billion to $50 billion within ten years. Omar Puertas, the Managing Partner of Cuatrecasas Shanghai, rounded out the panel by sharing his experiences as a lawyer, facilitating Chinese ODI into Europe and Latin America. He shared that the concept of legal risk is inherently different in China, particularly as many of the institutions investing abroad are state-owned enterprises (SOEs) and are backed up by the Chinese government. As the panel members represented different geographical areas, they were able to provide a comprehensive view into Chinese foreign policy, as they often disagreed with each other. An overarching theme of the panel was that Chinese foreign policy manifests itself differently in different geographical areas. 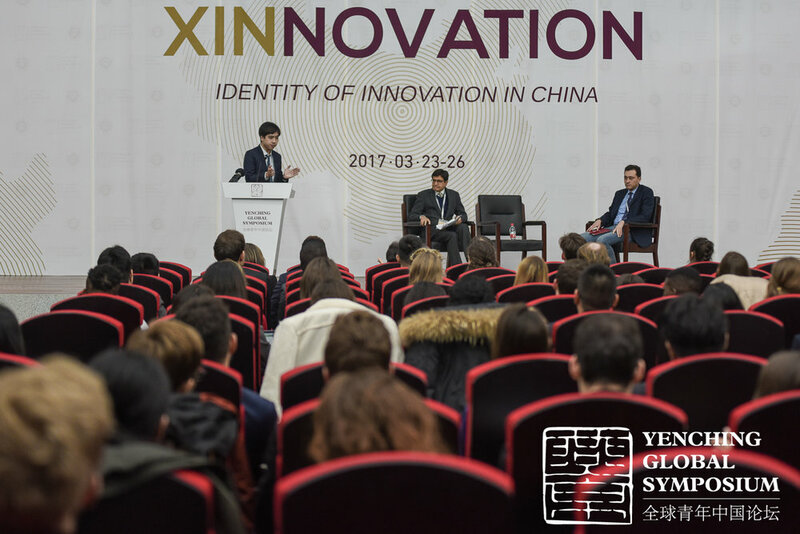 On March 25, the Yenching Global Symposium sponsored the first annual Xin World Innovation Fair. This event featured panels, showcases, and lectures by notable individuals and companies in the technology market. It also featured a demo zone, where companies and NGOs with high levels of social impact introduced their innovative solutions to students. Event attendees first enjoyed a talk by Rebecca Fannin, the founder of Silicon Dragon, a news, events, and research group covering innovation and investment in China. They were then able to enjoy a panel entitled “Future of Urban Transport” with executives from Evoke Motorcycles, a new electric motorcycle brand based in Beijing, and Bamboo Bikes, which has created a community-driven social enterprise to create and innovate bicycles made from bamboo. Another discussion which captivated the audience was by Paul Xu, the Vice President of Shenzhen DaJiang Innovation Technology Limited Company. He discussed how the drone market will change as drones continue to develop more industrial applications. He shared how drones are being used for the agricultural, energy, public safety, media, and infrastructure sectors. He answered many questions from the audience, from regulations in China to the growth of the market. Other events associated with the Xin World Innovation Fair included a panel of Sustainable Transition featuring Environment china, UCCCE, and CDP. It also featured a showcase entitled “Discover VR + AR” sponsored and presented by the Microsoft Corporation, as well as a panel called “Incubating Success” which included Founders Space, Technade, and Wao Space. Other organizations that were represented in the fair included Jump!, an organization which promoted youth leadership and professional development; Education Girls of Rural China (EGRC), which has helped over 325 women to become university graduates; Valeon, an education technology start-up which provides mentorship to Chinese high school students on scholastic and professional decisions; Adopt-A-Plant, which is developing an APP to allow people to identify plants, as well as buying/selling platforms for plants; JingJobs, which is a job platform, connected bilingual and foreign talent to Chinese startups; and SmartAir, a Beijing startup which promotes do-it-yourself (DIY) air filters. Evoke Motorcycles and Bamboo Bikes also exhibited their products, bringing prototypes to the Innovation Fair and explaining their prototypes to the attendees. Under a light blue sky, the Global Center for Innovation and Entrepreneurship of Peking University has opened its doors to Xinnovation Fair 2017. The rich schedule – which features promising start-ups, dynamic presentations, innovative projects – has created a vibrant and energetic atmosphere, allowing delegates and visitors to “venture into the future” and “explore sustainability”. But what do people here think of “innovation”? And ultimately, what is “innovation”? “Innovation means ideas. It’s a driving force for myself, my country and the world’s development”, a Chinese visitor says, and he’s surely not the only one to think in these terms. In the words of a Brazilian delegate, innovation is “essentially something that can push society forward. My field is sociology and I’m particularly interested in the way new technologies can help tackle social issues”. Social impact seems to be one of the main key-words for many. “What makes innovation worthwhile is not much its intrinsic component of originality and creativity, but rather its capability to address everyday problems. Achieving social justice should be one of the main goals of innovation.” observes a start-up manager. “Minimizing the required input and maximizing the social output seems to be the golden formula for innovative projects”, another start-up founder says. An American delegate adds that “usually innovation is associated with creative thinking and risk taking, which are essentially capitalist concepts. In a society where “the survival of the fittest” seems to be only functioning self-governing mechanism, it is not a case that military intelligence has often paved the way to the introduction of new technologies, from the internet to today’s drones. I’d say that critical thinking is today’s most precious and sought-after innovation, and the only one that can truly lead to change in better”. This afternoon everyone once again filled the lecture halls for the discussion panels. A group of three innovators and founders of Chinese tech-companies spoke at a panel on technology. The panel was moderated by Rebecca Fannin, the author of “Silicon Dragon” and an expert on global innovation and investment trends. The first panellist was a German entrepreneur Dirk Eschenbacher, who co-founded Zanadu, a luxury travel service company. He shared his experience on working with a very specific Chinese demographic that is willing to pay high price in order to have an individual and high quality trip. The company not only provides online services, but has also expanded into releasing an offline magazine and providing support on WeChat. Currently it is now even delving into the VR market to provide a cheaper, but still immersive way to “see the world”. The second panellist was Joe Xia, the co-founder and CTO of Mobike, a bike-sharing platform. Joe Xia spoke about the founding of this start-up several years ago, as an outcome of awful traffic and pollution in big cities of China. He shared various new innovations with the audience, especially one having to do with the redistribution of the bikes depending on the demand. Before, this was done by the company, however, since this week, the users themselves are financially incentivised to help distribute the bikes. This is both cutting on the expenses and creating a feeling of community among consumers. Joe Xia also mentioned the possible global expansion. Only a couple of days ago Mobike was introduced in Singapore and the next perceivable market in the list seems to be the US. The last panellist to share his experience of owning a tech-company in China was Paul Xu, the Vice President of Shenzhen DaJiang Innovation Technology. This company is currently one of the most innovative and largest drone manufacturers in the area. However, the initial popularity of the products came from the directors in Hollywood, who needed simple-to-use drones for movie production. Paul Xu talked about the move back to the Chinese market and attempts to expand here. In China, he said, they mainly focus on making the drones an enterprise tool that can be used in architecture, fire-fighting, even farming. Paul Xu also highlighted their success in commercialisation and marketing, after all they are not involved in engineering “rocket science”. 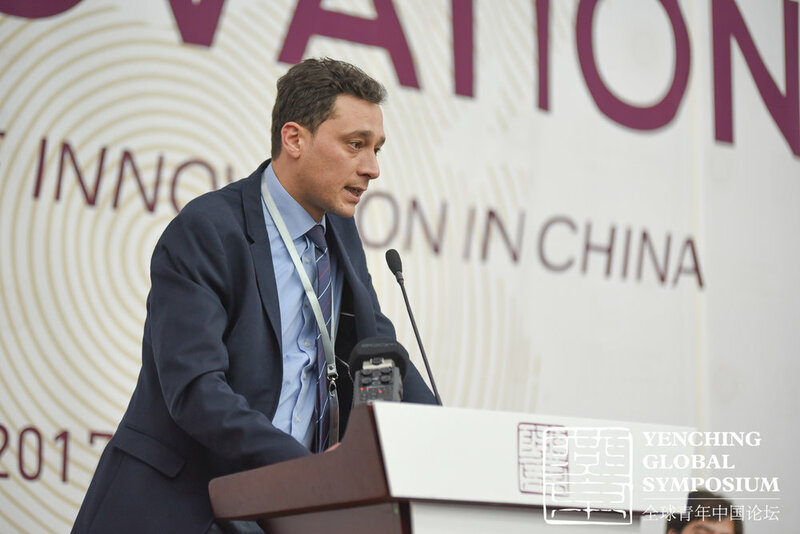 The third day of the 2017 Yenching Global Symposium was opened by a keynote speaker Eric X. Li. Eric X. Li is a venture capitalist, and political scientist based in Shanghai. He is the founder and managing director of Chengwei Capital. 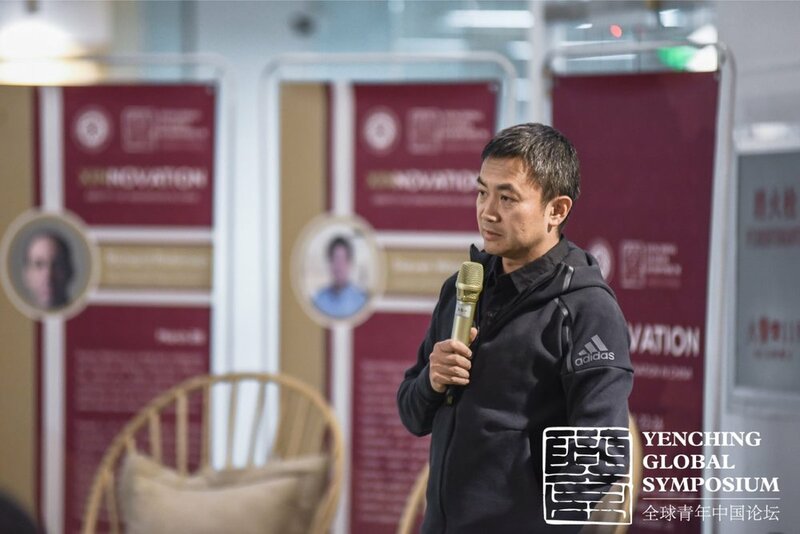 During his speech, titled “The Chinese Entrepreneurial Economy – The Next 10 Years” Eric Li introduced his company’s work and perspectives on the future of the Chinese entrepreneurship. He began the presentation by raising two bets: “The most valuable company in the world 10 years from now will be a Chinese tech company. The second most valuable company in the world 10 years from now will be a Chinese tech company”. Eric Li gave some examples of the companies that Chengwei Capital invests in. Those being AAC technologies (the world’s largest mobile acoustics provider), 1 Smart (the largest after-school education company in Shanghai), Youku (the largest video company in China), and Koudai (the largest mobile e-commerce social network in China). All the companies are immensely successful and have experienced exponential growth in their value and volume in the past few years. Li talked about the major paradigm shifts in the Chinese entrepreneurial economy that allowed for such an expansion. First of all, raw growth in terms of volume is no longer the primary focus, as many businesses are turning their attention towards the value growth. This is happening due to the consumers being interested in the goods and services that they want, but not necessarily need, and also due to various entrepreneurial improvements. The presentation was concluded by a discussion on the competition and innovation that is happening both among the largest companies of China, such as Baidu or Alibaba, and also among the very recent unique start-ups. These start-ups are challenging the existing system and are more willing to expand globally. These companies include not only domestically concentrated businesses, as Mobike or Didi, but also fully foreign-focused platforms, such as Musical.ly or APUS Group. The presentation by Eric X. Li gave an insight into the market of unicorn companies that are ever-multiplying in China and their relationship to the established market and the venture capitalism. YCAST 燕语 went around this morning to meet some of the visiting delegates, learn about their research interests, and ask them "What does Xinnovation mean to you?" Take a listen! Members from the YCA Music Club (and some guests) came together for a jam session the night before the conference -- listen in for some great covers and original music. YGS 2017 starts off with a bang! Listen in to chairman Ivel Posada Martinez, Dean Yuan Ming, and President of Peking University Lin Jianhua as they ushered in the historic second year of the conference! Today's exploration of the theme "Identity" started off with two fantastic keynote speeches by innovative ecologically-minded designer, Yu Kongjian, and world-famous artist, the "Invisible Man" himself, Liu Bolin. Professors Krishnan Kumar and Giray Fidan lay out their opening arguments about China's historical development and modernization in a debate moderated by Yenching Academy's own, Benjamin Pham. Moderator, and Yenching Academy's own, Rosie Levine, sits down with Wang Hongguang, Li Kuanghan, and Maria Mertzani to speak about innovative approaches to cultural heritage and identity-building in both China and Greece. Delegate Oliver Steindler (Czech Republic) presents on "Traditional Chinese Medicine in Post-Communist Central Europe as a Tool for Chinese Soft Power Policy," Kevin Shaw (USA) presents on "An Introduction to Ethnographic Methods for Innovation," and Alexandria Williams (USA), "From South China to South Atlanta: Revolutionary Exchanges between China and Black America" during the Delegate Presentations. YCAST's own, Eun Seo and Benjamin Trnka sit down with Krishnan Kumar and Giray Fidan (from Day 1's Debate), Maria Mertzani, Li Kuanghan, and Wang Hongguang (from the Cultural Heritage Panel) and Ted Plafker and Ni Ching-Ching (from the Journalism Panel) to chat about their work. The topic leading the second day of the Yenching Global Symposium is experience. The keynote which launched the day’s academic activities was by Dr. Mao Daqing, the Chairman and Founder of UrWork. Although he has an esteemed career – from serving as the Senior VP of the Vanke Group to 23 years working as an architect – he targeted the message of his keynote to the young delegates. First, he shared the message of following your dream. During his career as an architect, he noted that he had no chance to realize his personal vision, he always had to cater to his clients’ needs and desires. He felt the need to build something that he really loved and that something that could touch people’s hearts and allow them to then fulfil their dreams. His goal for the future is to have 10,000 companies working under the UWork platform within the next 3 years. He noted the constantly changing business environment due to the vast momentum of technological innovation and asserted that companies need to adapt with these changes. He also stated the importance of cross-cultural communication that co-working spaces can foster, so that people from different countries and cultures can learn from each other. 92 foreign companies currently operate within UrWork. He says that the ecosystem which co-working spaces create is healthy and provides foreigners with an in-depth understanding of how the Chinese market operates first-hand. Besides the keynotes, an immersive panel also took place during the first day of the Symposium. 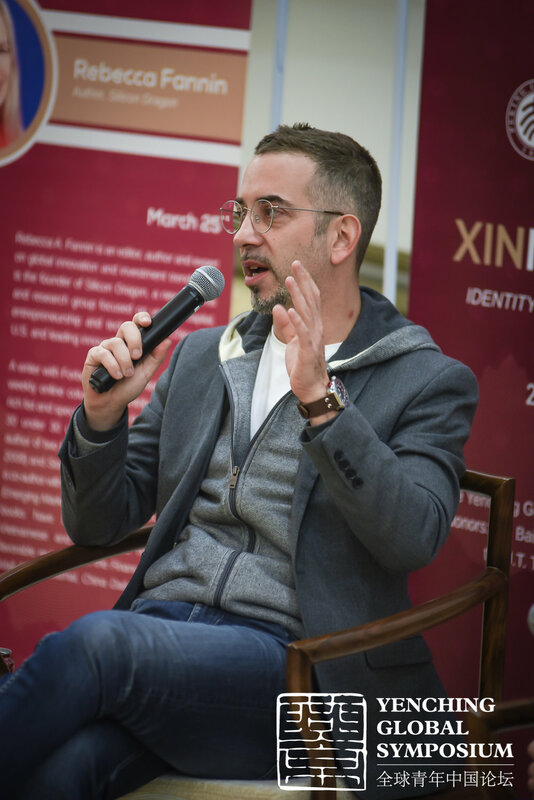 It was on the topic of cultural heritage and involved three prominent specialists, whose discussion was moderated by the 2016 Yenching Scholar Rosie Levine. The panel featured three presentations and a discussion session with questions coming from the moderator and the audience. The first panelist to speak was Maria Mertzani from Greece. She is the Head of Directorate of Conservation of Ancient and Modern Monuments, which is under the administration of the Hellenic Ministry of Culture and Sports. Mertzani mainly spoke about the projects of her Directorate and the ways they use innovation to make the conservation work easier. The main aim of using the latest technology, such as installing sensors for temperature and humidity tracking, using CT scanning and 3D scanning in excavations, is to “know more while doing less”. This allows the Directorate to be more efficient in preservation work and also to predict, when the work may intensify, as a result of environment changes or natural disasters. The second presentation was given by Li Kuanghan, the Director of the Global Heritage Fund’s China Heritage Program. She introduced two key preservation and conservation projects in China. The first is the Pingyao City in Shanxi Province. Although the whole city is considered to be a heritage site, only 10-20% of the place is up-kept and preserved. This project aimed to connect the wishes of locals with the financial resources of the local administration to slowly reconstruct the old pavilions. The second project was based in Dali Dong Village in Guizhou Province. This place is a Dong minority settlement, completely surrounded by mountains. Once again, the project connected the resources of the higher administration and the motivation of the locals to reconstruct the village, while keeping its historical and aesthetic value intact. Lastly, the representative of Travel in Geography Wang Hongguang gave an introduction to a recent project “City as Museum”. She talked about ways the daily surroundings can be interpreted as an artistic setting. Even the Peking University campus is full of historic buildings and people’s memories about the earlier years, even the natural spots are full of cultural and historical value. The main idea of the project is to contact various people around Beijing, especially the older inhabitants of the hutong area, and let them share their reminiscences of the old days and buildings that stood before they were turned into touristic attractions or got demolished completely. The discussion following the presentations mainly centered around the topic of identity of cultural heritage and the perception towards it. While at one point the buildings might not have been viewed as significant historically, or the heritage of a certain group’s culture has not been perceived as important, in several years the same places can become the main topics on the legislative level. Students had an opportunity to listen to an inspiring panel about young entrepreneurs in China. We had three speakers that have both local and international experience. The panel had the speakers talk about their work in China and then have a discussion with the questions coming from both the energetic moderator Richard Robinson and the audience. The first panelist was Steven Wang, a Chinese-born Canadian, who is the founder and Chief Executive Director of Yiqiao China. He primarily works with the top youth from around the world, who have the potential to serve in the social sector. Steven talked about his experience in the public sector, and his life of growing up in a small Canadian town, but then going on to do great things in China, where he rediscovered his roots and passion for social work. The second panelist was Gavin Tanzer-Newton. He, as Steven, grew up in a small town in the United States, but broke through the isolation and in the end moved to China, where he founded “Sunrise International Education”. His main focus in on the education sphere in China, he works with both local and international students, who have aspirations to study abroad. The final panellist was Tawanda Mahere. He spontaneously moved to China, where he learned the language and experienced the business culture first-hand. He is the Emerging Markets Director at Jide Technology and wishes to build a bridge between the African and Chinese entrepreneurs. He helps both Chinese and African businesses to understand each other and collaborate better. The discussion part of the panel covered a lot of different topics – from the panelists’ experience growing far away from China and the coming here to become young innovators, to their suggestions for all the student, such as not being afraid of challenges and mistakes, and how important it is to first understand the local communities before getting hands on huge projects. They also highlighted that being an outsider is not a bad thing, as it may allow one to have a completely different perspective of a certain matter and bring a unique point of view to the table. To continue exploring the idea of “identity” in modern China, Yenching scholar Benjamin Pham moderated a panel discussion with Krishan Kumar and Giray Fidan in order to reconcile China’s historical development with its long-term modernization. Giray Fidan is an Associate Professor in the Department of Chinese Translation Studies at Gazi University in Ankara, Turkey. Krishan Kumar is a Professor of Sociology at the University of Virginia. When tackling the issue of modernity in China, it is an interesting approach to look back to the past, instead of looking forward to the future. However, both scholars deemed it necessary to do so. Krishan Kumar began by stating a question that has long puzzled China watchers: Why is it that the West, and not the East, developed what we now view as modernity? From a sociological approach, he mentioned Max Weber’s “The Protestant Ethic and the Spirt of Capitalism” and shared his belief that modernity is an expression of the capitalist system. He then discussed why Confucianism, Daoism, and Buddhism did not lead to the creation of a capitalist system within China. Giray Fidan expanded on this topic by sharing his thoughts and research in comparing non-western experiences of modernization. In particular, he noted that comparisons can be made between the Chinese and the Ottoman empires. On the early morning of the 23rd of March, the Peking University School of International Studies was busy with action in preparation for the Opening Ceremony of the 2nd annual Yenching Global Symposium. The last strings of six-months of preparations were finally coming together into the four-day event full with lectures, discussions, site visits, and informal dialogues. At 9 AM sharp, the school doors opened up to all the international and domestic delegates, special guests, and speakers. 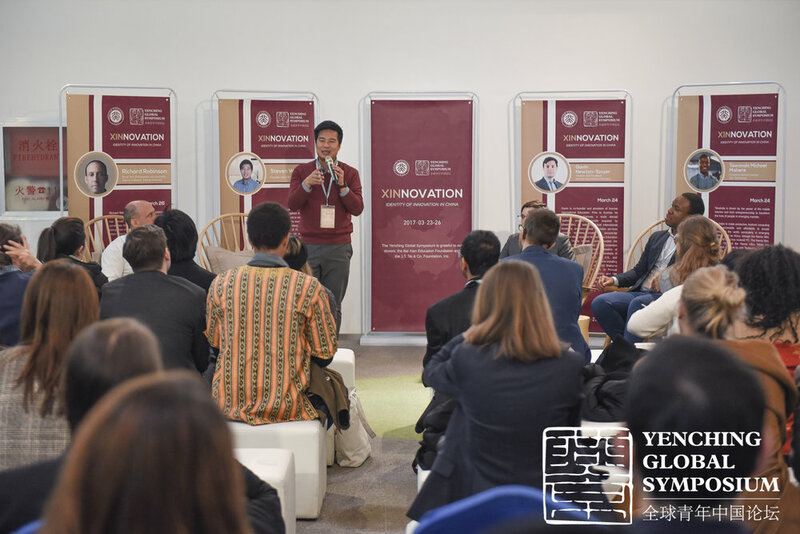 After a short registration and socializing over morning coffee, everyone gathered in the main hall where the Yenching Global Symposium officially began. The lights dimmed and an introductory video began to play, highlighting the delegate profiles and the topics of the Symposium. Following the video which seemed to excite the attendees even more, the Chairman of this year’s Symposium, Ivel Posada (Cuba/US, Harvard University), welcomed the delegates and guests. He briefly introduced the activities and topics, as well as the individuals who will play important roles during the Symposium. He highlighted the hands-on approach of this event, noting that the delegates will communicate, work, and collaborate with one another, instead of simply listening to lectures. Lastly, the President of Peking University Lin Jianhua congratulated the attendees and provided his remarks on the importance of the Yenching Global Symposium to Peking University, as well as to China. He shared his excitement about the widespread influence of Chinese innovation and culture on the international community. He praised the attempts to connect and expand the dialogue between China and the West about the topic of innovation. The President also wished for an exciting week of activities and hoped for such events to happen again in the future. After the official speeches, the participants had the chance to take a group photo outside the building. They also continued discussions and social networking during a short mixer outside the main hall, while it was being prepared for the upcoming speeches and events. 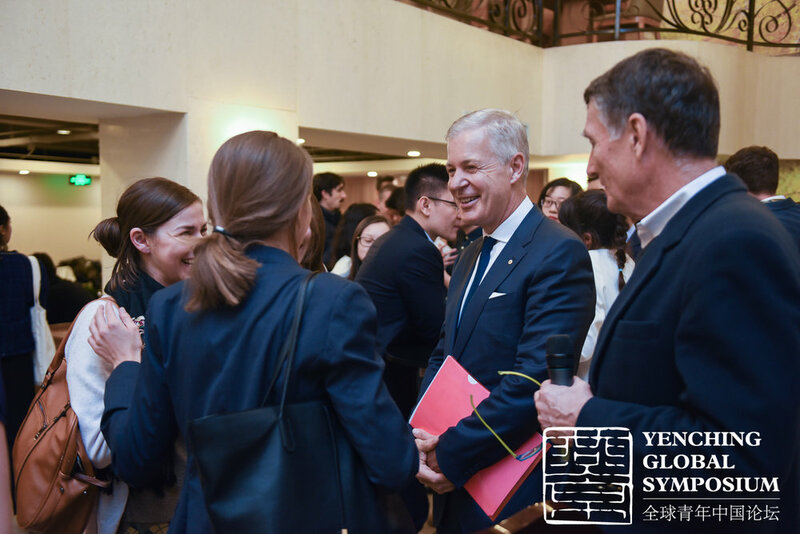 The 76 delegates selected from more than 2,200 applicants ranging from almost 150 countries are joining the 124 Yenching Scholars for the second annual Yenching Global Symposium. Today, the international delegates arrived at the Beijing Capital International Airport, where smiling Yenching volunteers greeted them. The delegates and the Yenching Scholars now are mingling, registering for the Symposium, and resting before the activities which will last the remainder of the week. Over the next four days, the participants will embark on an unforgettable adventure! 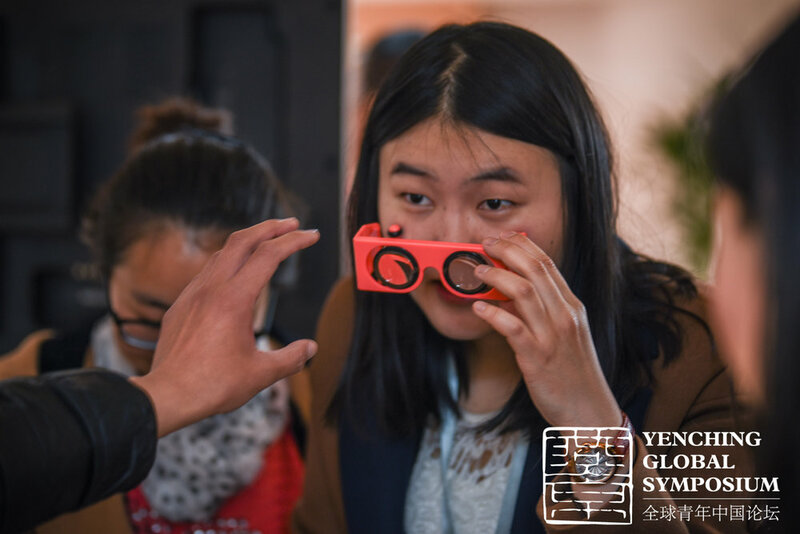 This year’s Yenching Global Symposium is centered around four main themes that will be explored through a variety of keynotes and activities. These themes correspond to the four meanings of the Chinese word “xīn”: “heart” (well-being), “new” (direction), “joyful” (experience), and “dawn” (identity). Delegates will engage with a variety of interesting individuals – thought leaders, academic experts, professional innovators, and other global scholars. They will not only listen, but also do. This year’s Symposium is not only longer and involves more guests than the previous Symposium, but also has a more hands-on approach. Therefore, the delegates will not simply listen to the keynotes and panels, but also participate in simulations, social events, and site visits. On Day 1 (March 23rd), the delegates will engage with the topic of identity. This day will officially kick-start the Symposium with an Opening Ceremony which will be followed by a keynote from Liu Bolin. Later on in the day, there will also be two parallel panels on Journalism and Cultural Heritage. The day will end with the domestic and international delegates giving presentations on their individual research projects. On Day 2 (March 24th), the delegates will engage with the topic of experience. The day will be centered around five site-visits that are intertwined with simulated projects. The site-visits will introduce the delegates to different areas of Beijing – from art districts and media companies, to gastronomic centers and tech companies. Delegates will also listen to a presentation from Mao Daqing and partake in a panel on Young Entrepreneurs. On Day 3 (March 25th), the delegates will engage with the topic of direction. In the morning they will listen to a keynote by Eric Li. 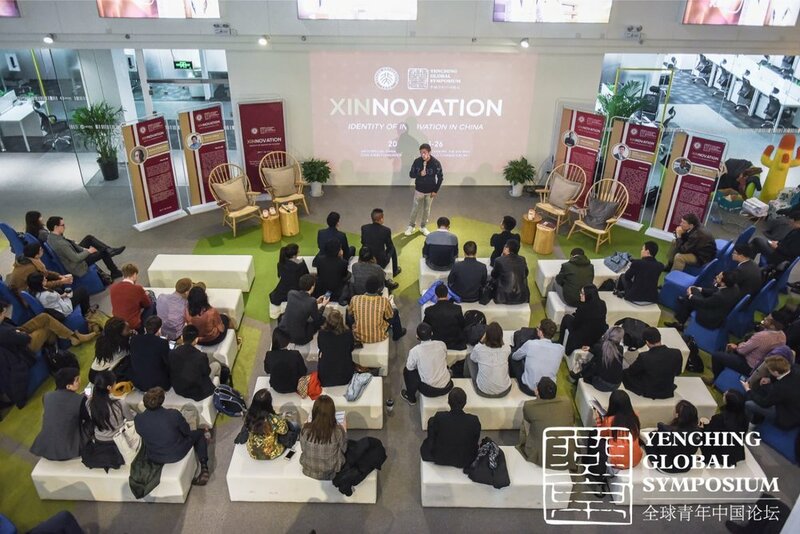 This will be followed by an essential part of the Symposium – the Xin World Innovation Fair. During this fair, various start-ups, organizations, and entrepreneurs from China will meet with the delegates and other students. This will be an excellent opportunity to network and exchange experiences. On this day, delegates will also have two concurring panels on the topics of International Relations and Technology. On Day 4 (March 26th), the delegates will engage with the topic of well-being. This day will be the last day of the Symposium, which means that it will include several concluding activities, a Closing Ceremony, and a Farewell Event. In addition, the delegates will participate on panels about either Education or Health.